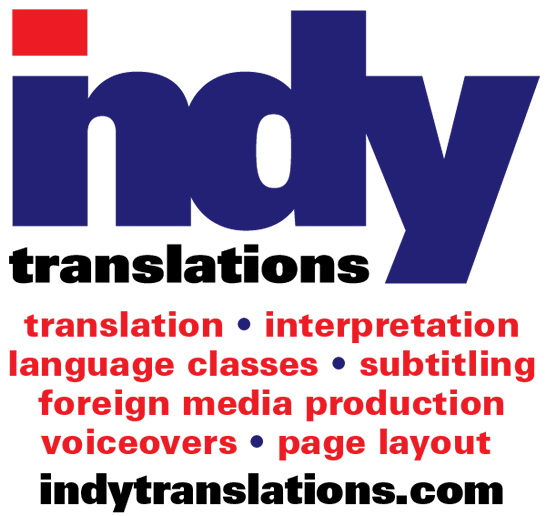 Indy Translations, LLC is a full-service language communications company that was founded in 1997 by Richard Kelly Hocker and William L. Zart. Our company mission is to offer clients of any size top-quality, accurate, culturally-appropriate and confidential language services in which both our clients and we can take pride. Our ethical and uncompromising commitment to superior translation work and customer service ensures that each client receives the same excellent quality of service so that both companies look great. Our cadre of complete language services is offered locally, nationally and internationally in all major world languages. We provide language translation, interpretation (consecutive, simultaneous and telephonic), instruction, multilingual desktop publishing/page layout, multimedia services and cross-cultural consulting. Indy Translations has a proven track record of success with its clients having provided top-caliber translation services to thousands of clients worldwide. With nearly tens of thousands of successful projects realized in the past two decades, we have hundreds regular corporate clients ranging from small, local companies to Fortune 500 corporations located throughout the United States and abroad. Our greatest growth has been within the business and technical sectors. The key to our success has been in surrounding ourselves with the best team of specialized language professionals all of whom have a proven track record of success within their particular language and discipline. We have a local staff of ten and draw upon thousands of the world's best subject-specialist translators, reviewers and editors so that only the most qualified professionals collaborate on each project. In 2003, we separated the language instruction division from the translation division creating a separate company called Indy Language Center. In October 2014, the language school was renamed Indy Language Center. We also operate satellite offices in Lake St. Louis, MO and North Palm Beach, FL.